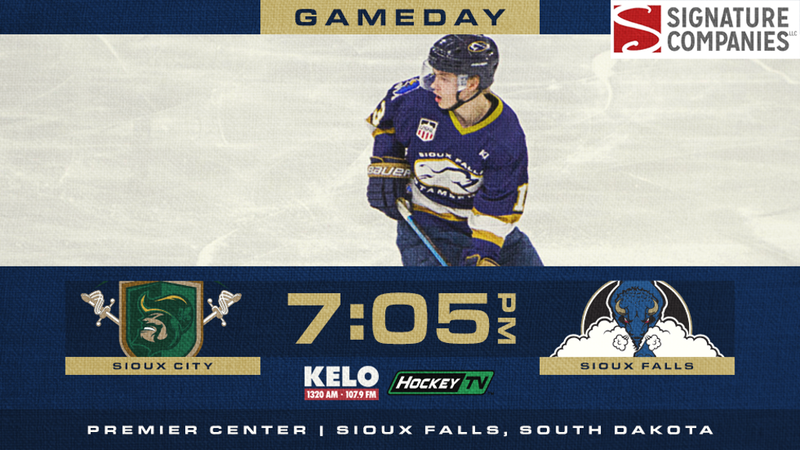 TONIGHT’S GAME: The Stampede face the Sioux City Musketeers for the final time during the regular season. Sioux Falls holds a 6-0-1 mark against the Musketeers this season, including a 5-3 victory in their last meeting back on March 23rd. These two teams could meet again next week in the first round of the playoffs pending how this weekend shakes out. FAN APPRECIATION NIGHT: Tonight is Fan Appreciation Night, presented by Signature Companies. We want to thank the best fans in the USHL For another great season and hope you’ll join us tomorrow night and for the Clark Cup Playoffs starting next week! Watch the video board tonight as we highlight some of our biggest fans. Be sure to stop by the Stampede sales table and register for a chance to go on the ice and shoot for a shot at 2019-20 Stampede season tickets! STAMPEDE UPDATE: The Stampede are coming off a weekend split in Youngstown last Friday and Saturday. On Friday, the Herd got two goals from Carl Berglund and topped the Phantoms 4-1. On Saturday, the Phantoms got revenge and blanked the Stampede with a 3-0 victory. The Stampede finished the regular season with a 16-11-4 mark on the road and are 5-3-2 over their last 10 games entering tonight’s contest. MUSKETEERS UPDATE: After it looked as though the Musketeers would be missing postseason play for the second year in a row, Sioux City has gone 8-2-0 over their last 10 games and captured the sixth and final playoff spot in the West. Last Friday, Sioux City extended their winning streak to three games and captured their fifth win in their last six games with a 4-2 victory over the Anderson Cup champion Tri-City Storm. PLAYOFF UPDATE: There is still plenty to play for tonight if you’re the Stampede. Sioux Falls enters tonight tied with Waterloo for second place in the West with 81 points. The top two teams in each conference receive a first-round bye. The Black Hawks hold the tiebreaker on the Stampede meaning Sioux Falls will have to finish this weekend with more points than Waterloo. A regulation loss by the Stampede and a win of any kind for Waterloo tonight against Dubuque would clinch second place for the Black Hawks. Should the Stampede finish third they would open next Tuesday at home against Sioux City in a best-of-three first round series. If they capture second place outright, the Herd will get a bye and host a Western Conference semi-final series next Friday or Sunday at the PREMIER Center. For the latest playoff information visit sfstampede.com/playoffs or follow the Herd on Facebook or Twitter @sfstampede. UP NEXT: The Herd close out the regular season tomorrow night at home for Take My Jersey Night, presented by Waterbury Heating & Cooling and Coleman Heating & Air Conditioning at 7:05 PM. Fans can purchase raffle tickets for a chance to take home a game worn jersey right off the players backs! These jerseys are the black 20th anniversary throwbacks that have bene worn throughout the season. Half of the jerseys will be raffled off during the first intermission and the rest during the second intermission, proceeds benefit the Make-A-Wish Foundation. Tickets are on sale now through the KELOLAND Box Office or any Ticketmaster outlet.